ROME (AP) — The killing of Jamal Khashoggi shocked the world not only because of the grisly details of his death, but also because of where it took place: inside a consulate, which enjoys special protections under international law. DO THE SUSPECTS IN THE KHASHOGGI KILLING ENJOY DIPLOMATIC IMMUNITY? Diplomatic and consular immunities are privileges granted to diplomats and consular officials under international law. They include protection against criminal prosecution and being exempt from paying taxes in the host nation. This immunity is a cornerstone of international relations and is spelled out in two treaties: The Vienna Convention on Diplomatic Relations and the Vienna Convention on Consular Relations. Saudi Arabia has so far not claimed diplomatic immunity for the 18 suspects, whom Turkey’s president on Tuesday identified as three consular officials and 15 people who arrived in Istanbul shortly before Khashoggi’s death. But legal experts say such immunity is probably not applicable in this case anyway. Unlike ambassadors and other high-ranking diplomats attached to an embassy, consular officials don’t have absolute immunity under the Vienna conventions and may be put on trial by host country courts if they are suspected of serious crimes. Saudi officials say Khashoggi died accidentally as the result of a brawl. WHO HAS JURISDICTION IN THE CASE: TURKEY OR SAUDI ARABIA? A common misconception is that foreign embassies and consulates are considered territories of the foreign country. They are not. The Saudi Consulate in Istanbul is on Turkish territory, which President Recep Tayyip Erdogan stressed in his speech Tuesday. That “categorically” gives Turkish authorities jurisdiction in this case, said Scott Anderson, an international law expert at the Brookings Institution in Washington and a former US diplomat. However, that doesn’t mean Turkey will be able to prosecute Khashoggi’s killers. Since the suspects are all in Saudi Arabia, they could only be tried in Turkey if the kingdom agrees to hand them over. Saudi Arabia has said it’s conducting its own investigation in what it describes as a rogue operation and will punish those involved. 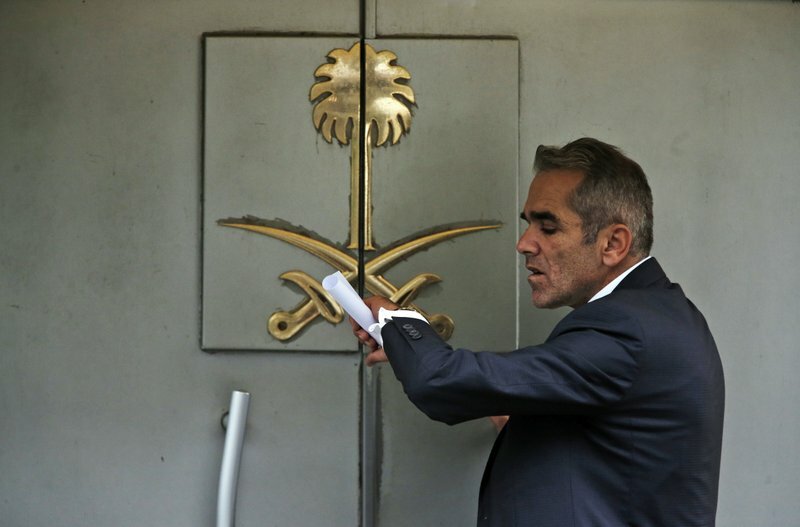 WHY DID IT TAKE SO LONG FOR TURKISH INVESTIGATORS TO SEARCH THE SAUDI CONSULATE? Turkish crime scene investigators were only allowed to search the consulate on Oct. 15, nearly two weeks after Khashoggi disappeared, prompting international criticism. UN human rights chief Michelle Bachelet urged Saudi Arabia to waive the “inviolability or immunity” of people or premises under the Vienna Convention on Consular Relations and reveal what happened to the Saudi writer. On Tuesday, Erdogan said the Saudis should have opened their consulate “immediately” and suggested that international rules on immunity should be reviewed. Legal experts say it’s unlikely that countries would accept changes to diplomatic immunity, a principle that is universally accepted and rarely breached; the 1979 seizure of the US Embassy in Iran was a notable exception. “It’s a fear of contagion, if we give states any kind of excuse to suspend immunity, that they will take advantage of that and that overall the system will be harmed,” said Steven Ratner, a law professor at the University of Michigan.